Marijuana is the second most used substance by teens in Winona County, alcohol is the first. 5% of 8th graders, 5.9% of 9th graders, and 17.2% of 11th graders used marijuana in the past month (2016 Minnesota Student Survey). 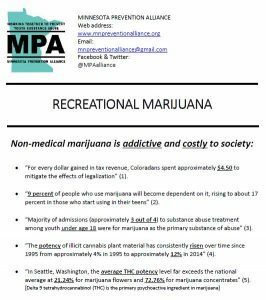 One of the concerns we have is that recreational (non-medical) marijuana is heavily promoted among students. In 2017, we launched a campaign with students to raise awareness about the large gap between perceived and actual use. Students produced a short film and advertisement that aired at the Winona 7 theater before movies, and on social media. They also helped to create billboard messages, all to show that most students do not use marijuana. How many students do you think actually use marijuana frequently (Once a week or daily)? Watch the 3-minute video (above) to find out. One of the concerns we have is that legalizing recreational marijuana will negatively impact our communities. We are concerned about the addictive potential and cost to society. See the fact sheets below to learn more and to use in conversations.